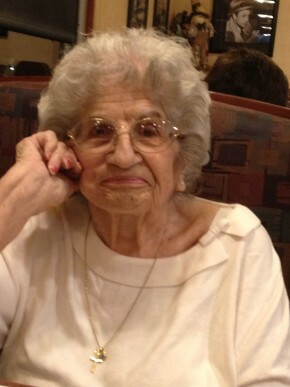 Zarien (Nalbandian) Simitian, 97 of Garfield, NJ formerly of Union City, NJ passed away on Sunday August 5, 2018 at home surrounded by her loving family. Born in Chelsea, MA, she moved to Union City where she was raised and eventually settled in Hackensack, Palisades Park and for the past 20 years in Garfield. Zarien was an avid reader and NY Giants fan, enjoyed trips to Atlantic City, playing cards and Keno, and cooking Armenian food for family and friends. For much of her life before retirement, she worked as a seamstress for various companies. She was a hard worker and was dedicated first and foremost to her family. She loved the Armenian church and its community. Beloved wife of the late Humayag Simitian and loving and devoted mother of her only child, Barbara Laudicina, and her husband Pasquale. Cherished grandmother of James Laudicina and Jeanette Fabi and her husband Eric. Dear great grandmother of Juliana Lucine Fabi who who she was overjoyed to welcome in 2017 and who lit up her life. Zarien was the adored sister of her late brothers Peter, Richard, and Edward Nalbandian. The family will receive relatives and friends on Wednesday, August 8, 2018, 2-4 & 7-9 PM, at Vander Plaat-Caggiano Funeral Home, 13-31 Saddle River Road, Fair Lawn, NJ, 201-797-3500. A funeral service is planned for Thursday 10AM at St. Leon Armenian Church 12-61 Saddle River Road, Fair Lawn, NJ 07410. Interment to follow at George Washington Memorial Park, Paramus, NJ. In lieu of flowers donations in memory of Zarien may be made to St. Leon Armenian Church.